In the western part of the Cyclades sits a beautiful mountainous island called Kythnos. The Athenians are especially attracted to this area on summer weekends to gaze at the wild beauty, picturesque architecture and lovely beaches. The most traditional villages on Kythnos Island are Chora and Driopida with stone houses and paved streets. The other villages Loutra and Merihas have the many tourist facilities. Soft sand and crystal water can be found on the beach of Kolona. The other beaches here in Kythnos Greece are private and serene for relaxing. The rest islands of the Cycladic island complex such as Serifos, Kea and Sifnos can be combined with Kythnos for holidays. Chora town has pristine churches, white houses and vibrant flowers. It is a classic and charming Greek town with all its picturesque landscape. An old charm is exuded in the narrow streets and quaint little squares, which fuse into an unstoppable combination with the quite modern and well equipped with restaurants. The must see churches that are famous in the area are the church of Agia Triada, the church of Agios Panteleimonas, the church of Metamorfosis, and last but not least the church of Agios Ioannis. These churches were for both Catholic as well as for Orthodox pilgrims which makes for an interesting fact. The Catholics would pray on the left side of the church while the Orthodox pilgrims used the right side. The oldest church of all of them is the Agia Triada which is also known as the Holy Trinity. A glimpse of the church of Agios Prodromos is coveted by a 17th century screen and is visited by many tourists and locals. Loutra is an especially fascinating attraction near Chora and can be found just 4.5 km away from the town. Its hot spas are believed to have healing waters and attract hundreds of visitors to witness these infamous waters day and night. You can see further information about Loutra below. Other famous beaches near Chora are Episkopi, Martinakia, and Apokrousi while all of these are easily reachable. Chora is the perfect place for a first stop when you get in the island because it is quite close to the port of Kythnos. Loutra is considered as the most important village of Kythnos because it is said that the thermal springs of the area have healing properties and are famous from the ancient times. It is a small village which is built around a beautiful and natural gulf in the northeast section of the island about 5 km away from the town of Chora and 11 km away from the port of Merihas. Loutra means bathing, in connection to the thermal springs of the area. A lot of visitors are attracted to this area to pursue a cure for the ailments in the thermal springs. Apart from port Merihas, Loutra is the unique place on the island that has a good night’s entertainment. There are various restaurants and clubs known for their outgoing and friendly atmosphere. 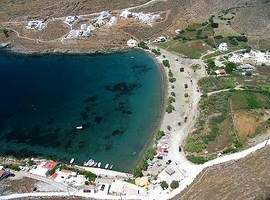 The older crowd usually chooses Chora; while the younger go to Merihas and Loutra village for the holidays. Loutra is also close to an important archaeological site. The site is the oldest settlement of the Cyclades islands. It is a Mesolithic settlement dating from 10.000 BC to 8.000 BC, in the area of Maroulas. Merihas is a small village that has kept its traditional appeal over the decades. 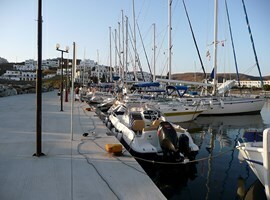 It is located on the west coast of the island about 8 km from the main town, which is the main port of Kythnos. The ferries from Piraeus and the nearby islands marshland. There are few permanent residents here at Merihas, most do not even speak English, but it is easy to communicate with them. During peak season, tourists come to the island and it gets quite crowded here. Merihas is connected to Chora by buses and many boat trips start at this point in Merihas in the summer. There are some rentals and hotels to stay in, but most of the available options are found around the port. The energetic nightlife attracts the youth and tourists here alike. In the many taverns of the village, you can enjoy a fresh fish meal by the water’s edge sitting right at your table. The site of Vryokatsro is nearby and is the ancient capital of the island. It was inhabited until the 7th century A.D. Here someone can see the ruins of the temples, the walls, the Roman buildings and the altars. One can also visit the church of Panagia Flambouriani. The closest beaches to the village of Merihas are the Apokrousi, Episkopi and Martinakia. 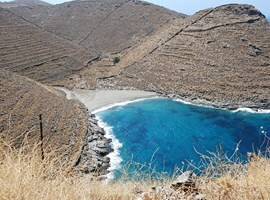 Apokrousi beach is the largest one on the island of Kythnos, Cyclades and is a blue flag beach. It has sand and trees and is located 3 km away from Chora village at the northern side of the port of Merihas and a little after the Episkopi’s cove. The onshore tavern has an expansive view of the sea that is amazingly beautiful. Chora is the closest village with several connecting buses from Merihas port to the beach. Also available for hire are taxis and motorbikes. Episkopi beach is small and charming. This beach has a 500 meter stretch of sand with only a single tavern. The fishing port of Merihas provides accommodation and water taxis or mopeds are available for transportation to Episkopi beach from Merihas. The beach is then connected by bus to Chora. This beach is great for swimming and very safe. It is a blue flag beach and its many trees protect from the winds. This beach is located south of Kythnos island and next to the beach of Simoussi in the Agios Dimitrios village. Ideal for those seeking tranquility and solace it has crystal clear waters and a long sandy beach to allure its visitors since this beach doesn’t get very crowded. This natural environment is unspoiled and does not have many facilities so take supplies with you and it only has a few summer houses close to the shoreline as well. Departing from Piraeus or Lavrion are ferries to Kythnos, both ports of Athens. Also connecting Kythnos to other islands of Cyclades, including Kea, Serifos, Sifnos and Milos.